Harvesting the solstice thunders / Gordon Kerry. Instrumentation: 2 flutes (1 doubling piccolo), 2 oboes (1 doubling cor anglais), 2 clarinets (1 doubling bass clarinet), 2 bassoons, 4 horns, 2 trumpets, 2 tenor trombones, 1 bass trombone, timpani, percussion, harp, strings. Commissioned by Australian Broadcasting Corporation with funds provided by Australia Council. Performing Arts Board. Score: Harvesting the solstice thunders / Gordon Kerry. 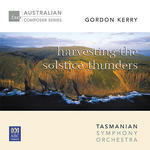 CD: Harvesting the solstice thunders / Gordon Kerry ; Tasmanian Symphony Orchestra. - Book: Sydney Symphony Orchestra education program 1994 : Meet the music 5, resource kit. - Book: Gordon Kerry : the influence of literature on the compositional process / by Nirmali Fenn.